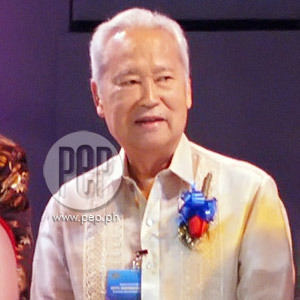 The movie industry mourns the passing of Atty. Espiridion Laxa—veteran movie producer, Metro Manila Film Festival executive committee member, and Film Academy of the Philippines Chairman. Laxa, 79, died last night, September 15, at 8:05 p.m.
Atty. Espiridion Laxa, Metro Manila Film Festival (MMFF) executive committee member and Film Academy of the Philippines (FAP) chairman, passed away last night, September 15, due to prostate cancer. He was 79. A lawyer by profession, Laxa served as senior partner in the Laxa, Mapile & Associates Law Office. But he was widely known in the showbiz industry as a producer and official of various movie organizations, such as the Film Academy of the Philippines, Philippine Motion Picture Producer Association and the Motion Picture Anti-Film Piracy Council Inc. He also founded the now defunct Tagalog Ilang-Ilang Productions. Some of the movies produced by the said company were Kilabot Sa Barilan (1960), Tondo Boy (1962), (1963), Isputnik vs. Darna (1963), Walang Hanggang (1964), Agent 69 (1964), Interpol: Hadlang Sa Manlulupig (1965), Deadline: Agosto 13 (1966), Durango (1967), Bigat Ng Kamay (1968), I Love You Honey (1970), Kay Ganda Ng Daigdig (1971), Kampanerang Kuba (1973), Dyesebel (1973), Darna and the Giants (1974), Darna vs. The Planet Woman (1975), Ikaw Ay Akin (1978), Ang Bagong Kardong Kidlat (1980), Basagulero (1981), and Ibigay Mo Sa Akin Ang Bukas (1986). The last picture produced by Tagalog Ilang-Ilang was the Fernando Poe Jr. starrer, Mabuting Kaibigan... Masamang Kaaway (1991) . Laxa's awards and citations include the Lifetime Achievement Award (Film Academy of the Philippines), Dr. Ciriaco Santiago Memorial Award (FAMAS), Manila's 1993 Awardee (Patnubay ng Sining at Kalinangan), and the Flavio Macaso Memorial Award (FAMAS). Atty. Laxa was also credited as one of the people who helped Star for All Seasons and now Batangas governor Vilma Santos recover from a big financial crisis in the '80s. In a statement sent by Leo Martinez to PEP (Philippine Entertainment Portal) through text message, he revealed that Atty. Laxa's cardiac arrest was "spawned by prostate cancer." Martinez added: "He had been a strong pillar of the industry for over almost 50 years. Services begin at 5 p.m. today, September 16, at Chapels 7 and 8 at Heritage in Taguig. "Industry leaders are organizing necrological rites on September 18 after the 7 p.m. Mass. Interment is on September 19 after the 9 a.m. mass."